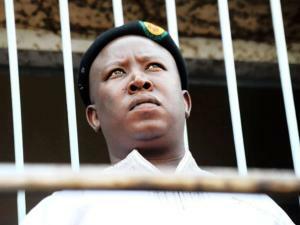 South African politician Julius Malema has appeared in court to face money laundering charges. A large crowd of his supporters has gathered outside the court in Polokwane, capital of his home state of Limpopo. There is a heavy police presence and long stretches of barbed wire fencing have been put in place. Julius Malema says the charges against him are politically motivated. He is accused of abusing his former position as head of the African National Congress (ANC) Youth League. Chanting and dancing outside the court, many members of the ANC Youth League are holding up placards saying “Hands off our leader”. Julius Malema is well-known in South Africa for his fiery populist rhetoric and lavish lifestyle, describing himself as an economic freedom fighter. The 31-year-old politician was thrown out of the ANC in April, accused of sowing divisions in the party. Julius Malema is a fierce critic of his former ally, Jacob Zuma, recently attacking the president over his handling of the Marikana miners’ strikes. Some in South Africa believe he is being rushed to trial – less than a week after a warrant for his arrest was issued – in order to strengthen Jacob Zuma’s political position. It is likely to be a long court battle that may offer insights into the corruption that many people believe blights South Africa. Julius Malema is also the subject of a separate tax investigation.